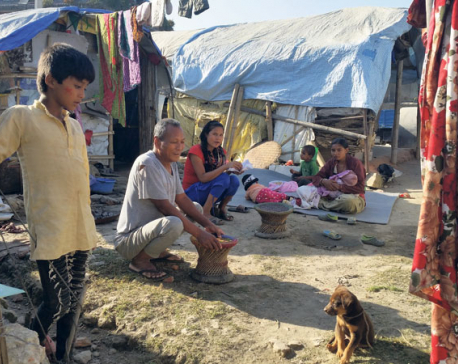 BANEPA, Dec 20: With the third winter knocking at the doors of their makeshift tents, quake victims of Kavre are worried about protecting themselves and their children from the chilling cold this year. With the mercury dipping every passing day, an expecting mother Maili Tamang of Thakle in Dhulikhel Municipality-8 is wondering how will she able to protect her baby after giving birth. Doctors have told her that she will deliver her baby in mid-winter. "I don't know how I managed to save my son during the last two winters but protecting a newborn will be a great challenge," she said. Her family has already received the first tranche of reconstruction grant. But she laments that the fifty thousand rupees was spent procuring land for the house. "We used some of the money to repay the loan borrowed for making the makeshift tent and the rest was spent purchasing land for the new house," Maili added. As they won't receive the second tranche without constructing the foundation, her husband has left for Malaysia to earn money. As many as 45 houses were damaged by the devastating earthquake of April 25, 2015 in Thakle and the neighboring Simpokhari. Except for two households, the rest will be spending another winter in their makeshift tents. Similarly, Purnimaya Tamang of the same village is thinking how she will protect her children and frail mother-in-law from cold this winter. "Our village gets blanketed by heavy fog and the cold wind blowing in the morning badly affects our health," said Purnimaya. The number of patients complaining of cold-related ailments has increased significantly at Dhulikhel Hospital. According to the emergency department of the hospital, most of those visiting for treatment include women, children and elderly from the quake-affected areas. On the other hand victims have not been able to build their houses due to lack of technical manpower. "We were expecting the government engineers to help us with the construction or at least to provide us suggestions, but that didn't happen," laments Maite Tamang of Simpokhari. As per the details provided by the Urban Development and Building Division Office (UDBDO), Banepa, 260 officials including engineers, sub-engineers and assistant engineers have been deployed in six municipalities and seven rural municipalities of Kavre to assist in the reconstruction work. "We are investigating whether the engineers are working in their assigned areas or not," said Pradip Basnet, an engineer with UDBDO. After the local-level restructuring, many VDCs were merged with municipalities and rural municipalities. So, many ward chiefs and officials don't have an office to work. So, many engineers who were operating out of the ward offices have now been operating out of their briefcases. 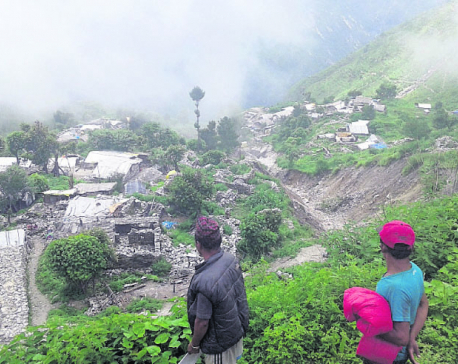 "This has affected the reconstruction process too," Basnet added. Besides that, there is not enough manpower in the villages as most of the youths fly to foreign lands in search of employment. According to Dhulikhel Municipality, there are a total of 4,846 quake victims in the municipality. But only 513 of them have received the second tranche while 107 have been provided the third and the final tranche of the reconstruction grant. This clearly shows that reconstruction is very disappointing. Although reconstruction work had picked up the pace two years after the earthquake, it was again delayed by the elections and festivals among other things. 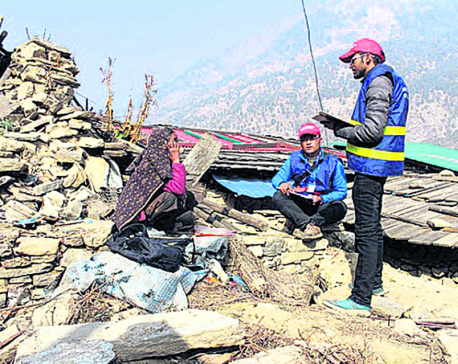 There are altogether 72, 417 quake victims in Kavre. Around 56,000 victims who have received the first tranche of grant are yet to start the reconstruction.